When it comes time to pick the perfect gift for kids, things can get tricky fast. Whether boy or girl, kids have a wide range of interests and passions, so we’ve hunted down some of the best gifts to have under your tree this year. Whether your teen is a fashionista or a cross-country runner, Lily Trotters’ compression socks make for the perfect gift. These socks not only offer sassy and fashionable designs, but are made with moisture wicking and antimicrobial materials. No more sweaty legs or stinky feet with Lily Trotters. 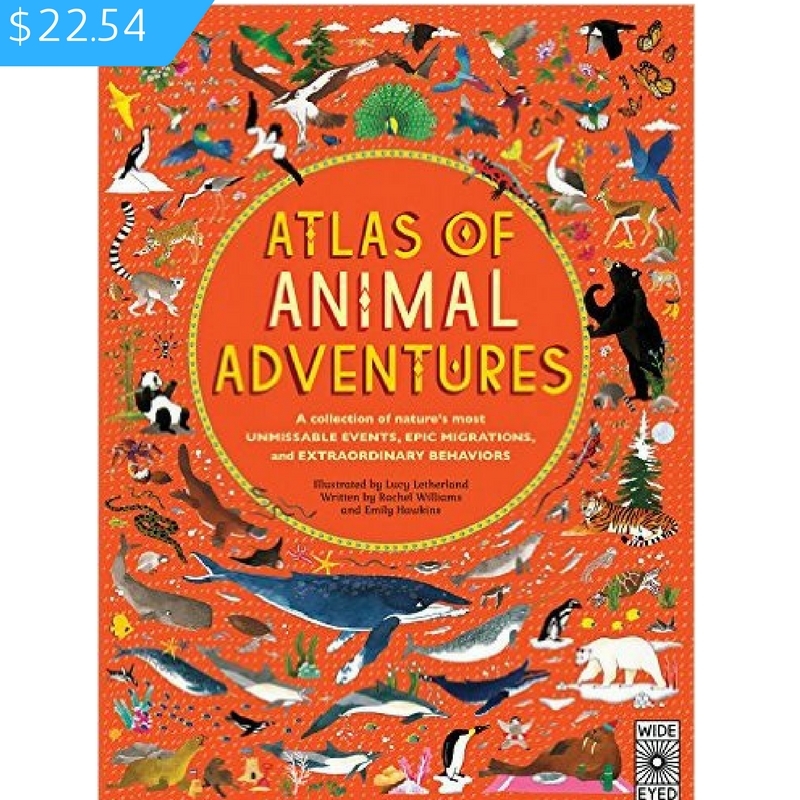 Head off on a journey of discovery, with this book that collects together nature’s most unmissable events from between the two poles, including epic migrations, extraordinary behaviors, and Herculean habits. Give every child a new way to learn - and enjoy - math! Math Lab for Kids shares more than 50 hands-on activities that make learning about math fun. Best for kids ages 7 to 10 and will be available at the beginning of 2017. Not ready for your kiddos to have their own phones, but want to stay connected? GizmoPal 2 by LG, allows your child to make calls to a few pre-set numbers like mom, dad, grandma or babysitter. You can also check-in on where they are through an app on your phone. Students who use sit-stand workstations burn more calories and have lower BMI than those who use traditional desks. The Hub27 is a wall-mounted, adjustable standing desk that serves as an organizer with compartments for things like notebooks and pencils, and also includes a channel to plug in electronics. Teens love to redecorate their rooms. Give your teen the gift of colorful illumination with one of Lava's® captivating lamps. They have a lamp for any and every style. Getting kids to eat vegetables requires a few tricks. Enter “The Rootlets,” a fun book series for K-3rd graders where broccoli, kale, corn and carrots have superhero status. Trouble at Plantasy Land follows four veggie-haired best friends as they discover their unique super “rootabilities” and put them to good use. This is a real, working Bluetooth smartwatch designed for kids. This high-tech watch has a touch screen with gaming and communication options. With watch-to-watch messaging via Bluetooth, the Kurio Watch Messenger app makes it possible for kids to share texts, emojis, drawings, voice recordings and photos, within a safe environment. From MLB to NHL to NFL, FANCHEST offers meaningful sports gifts delivered straight to your doorstep. For the kids who dream of becoming the next Troy Aikman, the Dallas Cowboys fanchests are perfect gifts for your future quarterbacks. As the days shorten, outdoor activities for the kids tend to come to a halt. Now, with the original kid-powered rocket, and thanks to built-in LED lights, the fun can continue long after dusk settles. And with a toy so fun, kids won’t even notice they’re exercising. Proudly made in Austin, lightweight (only 5.5 lbs) and durable with no sharp edges, this is the ideal first bike. It steers like a real bicycle, looks like a motorcycle and comes in three fun colors: red, blue and pink. No assembly required. Free shipping. Petite Plume is an adorable children's sleepwear line made for boys and girls. It is made with the best quality cotton, and is snuggly soft. The line is loved by the Royals; Prince George was even photographed wearing a pair. We love the blue and white striped boys pj’s! Now the whole family can enjoy the classic, award-winning Ticket to Ride. Build routes while seeing major monuments throughout North America – fun for all ages! Contains an all new game board, 80 trains, 72 train cards and 32 ticket cards.